Sometimes, a refreshing novelty upsets the ambient gloom that reigns in the current musical world. Oh, not a stroke of genius or global success. No, just a nice record that bucks us up, an unpretentious but effective production. 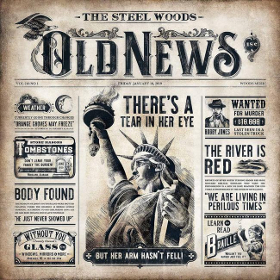 This is the case of this album of Steel Woods (a band from Nashville, the promised land of music) which contains a lot of good songs. A Southern country inspiration is felt on "Better in the fall" and "Wild and blue". The fast, melodic country title "Della Jane's heart" evokes a little the early Outlaws with a cool guitar solo. This is the best track of the album, closely followed by "I'm gonna love you" that mixes the country and "americana" styles and a melodic solo is worth the detour. There are also two good Southern rocks with medium tempo sprinkled with muscular six strings ("Hole in the sky" and "Let the rain come down"). When you come from Nashville, the ballad is unavoidable. The band respects this tradition with "If we never go" (country influence), "Straw in the wind" (rather "Southern country" with a well built solo) and "Uncle Lloyd" (in the style of the new Lynyrd Skynyrd but with more rustic arrangements). In the end, a beautiful realization that offers a cocktail of "country music", Southern rock and "americana". A record that feels good!